I think that the Reader, the Annotator, and the Journal are well designed both as parts and as a whole. The Edge is very good at taking an existing document and adding to it. But it isn't so good at creating a document from scratch. I'd like to be able to start a blank document and then open it in the Reader so I can annotate it. The Edge comes with Docs2Go (which includes support for MS Word). Unfortunately, you can't open that Word file in the Reader. It was good that Entourage decided to include this app; it fills a need. But I wish they'd put more work into integrating it with the other parts of the Edge. I like that you can attach all sorts of files to an ebook, but I'm disappointed that I can't attach a web page. I was told back in December that you could attach pages, not links. It may not seem like a big deal, but I thought the whole idea of the Edge was to gather all your resources on one device. Not attaching web pages would seem to go against that principle. I also regret the lack of collaboration features. I think it would be great if 2 or more students could share their annotations. Entourage also think this would be a great feature, and collaboration is on their to-do list. The Edge isn't for everyone. (No product is, for that matter.) But I do think the Edge is the best device in its niche. The goal was to come up with a practical digital textbook device, and I think Entourage succeeded. I have a question. I am looking for a device for college to use with electronic textbooks. I have decided that the kindle is not the way to go as the textbooks aren’t available for it. 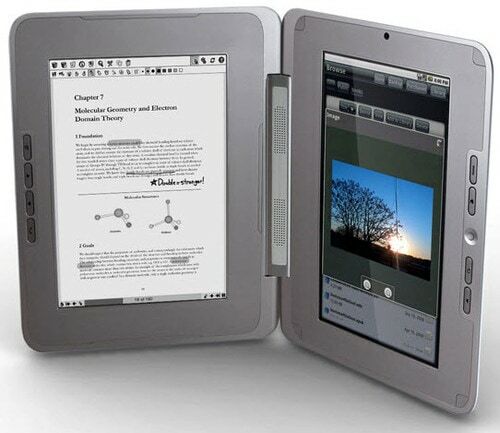 I have heard the Sony ereader has screen issues. My question then is this: How would you compare the use of the Entourage Edge to the ipad? I have an ipod touch (which I love) and have used it as an ereader, but the screen is just too small to want to read a textbook from. Both the Entourage Edge and the ipad are in the same price category, so that isn’t a factor for me. I have a 17″ laptop that I am using, but would like something smaller to read textbooks from, preferably with touch screen technology and color display, well I guess it is better to say, all the bells and whistles. I have seen in advertisements that you can make notes in a book. I like that to add notes in the margin of my books so that feature would be nice. I guess I just don’t want to spend $500 on an Entourage Edge and regret not going with the ipad.